I've been giving a lot of thought to my career trajectory lately, in no small part because a certain Pope (I won't name names, don't worry) recently visited New York, and in even no-smaller part because yesterday was Administrative Professionals Day, and all I got was a lousy Greatest American Hero box set including cape and instructions. Personally, I thought it would have been funnier if they HADN'T included the instructions, but that's because I'm a much more gifted comedian than the people who made the Greatest America Hero box set. Clearly. But my comedic skills, for once, are very much beside the point. And the point they are very much beside is this: there comes a point when you reach a point in your life when all signs point to becoming a Pontiff. 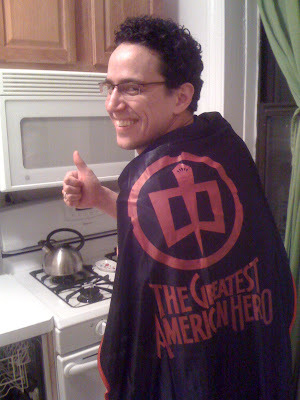 For me, that point arrived shortly after I donned my Greatest American Hero cape. It's as plain as day that after this, Pope is really the only option I have left. But it feels like a good fit for me. I have been gravitating naturally toward the kind of job that can disrupt all the traffic in New York City for a five-block radius, although the working on Sunday thing is kind of a bummer. Sunday is The Lord's Day, after all, which means that technically, the Pope is in violation of the Fourth Commandment of the Constitution, which means he is almost certainly going to hell. Seeking a challenging career as a Pope within a progressive institution which will utilize my skills and talents in management and administration, which comes with its own five-block radius of stopped traffic in New York City, as well as a vehicle with a name ending in "-mobile," and which will not make me work on weekends or go to hell. Funny hats a minus. High five-figure range, payable in either Estonian Krooni or in galleons, knuts, and sickles. I will be the first thousandaire Pope! I will give nearly nothing to charity! And I shall not be dark, but beautiful and terrible as the Morning and the Night! Fair as the Sea and the Sun and the Snow upon the Mountain! Dreadful as the Storm and the Lightning! Stronger than the foundations of the earth. All shall love me and despair! The problem, of course, is that job openings for Pope are EXTREMELY hard to find. I don't know if you've looked at the New York Times classified ads lately, but the pickin's for Popes are slimmer than a model barfing up her last meal before a 2pm bikini shoot. Still, it can't hurt to get my name out there, right? So to all both of you who are the only person not reading this blog, tell your friends about me. And if you happen to stumble across any Pope openings (ew, sorry), you know, make me sound good. Talk me up. Whatever. I'm counting on your support.